Lightning Network payments are routed through nodes to optimize for cost and reliability. Will payments route through super-connected “hubs”? Will they collect and share your information with the government? Andreas finds out. In the first part of my Lightning Network review I compiled and ran the Lightning Network Daemon, lnd. Today I’ll add more funds to my node and see how many channels I can open. Will payments routed through my node make me money? TL;DR: Maintaining a Lightning Network payment hub is stressful and makes very little profit. Hopefully the risk will decrease and profit increase as the Lightning Network gains traffic. 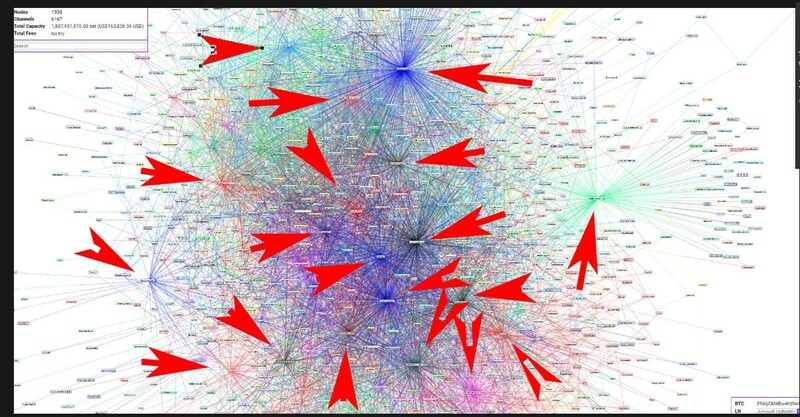 Visual representations of the Lightning Network are often posted online. They sometimes show the network as being highly decentralized/homogenous. Other times the network appears to be centralized around a few super-connected nodes referred to as hubs. The right-most graph was found on r/bitcoin and depicts a decentralized and homogenous topology. The two left-most graphs were found on r/btc and makes the network appear centralized around a few hubs. The deposits to my node have confirmed. I set up a terminal window on the lnd node with four panes. Each pane polls my node for stats. Bitcoin amounts are displayed in satoshis. To convert from satoshis/sats to bitcoin, I divide the number by 100 million or 10⁸. 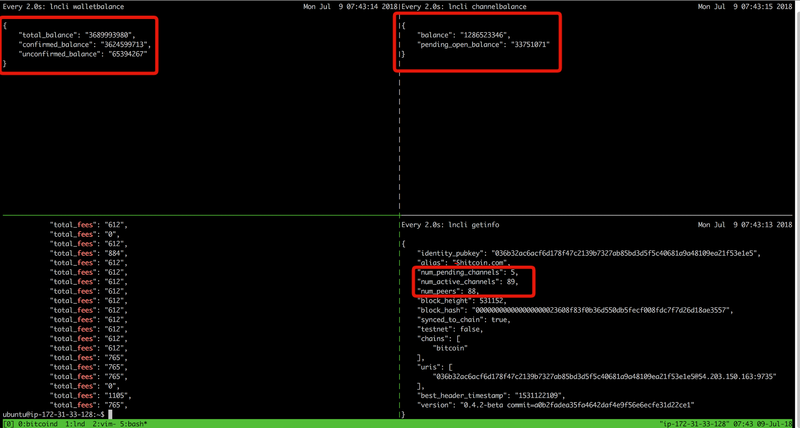 The top-left pane shows the output of lncli walletbalance. This tells me how much on-chain bitcoin is held in the node. 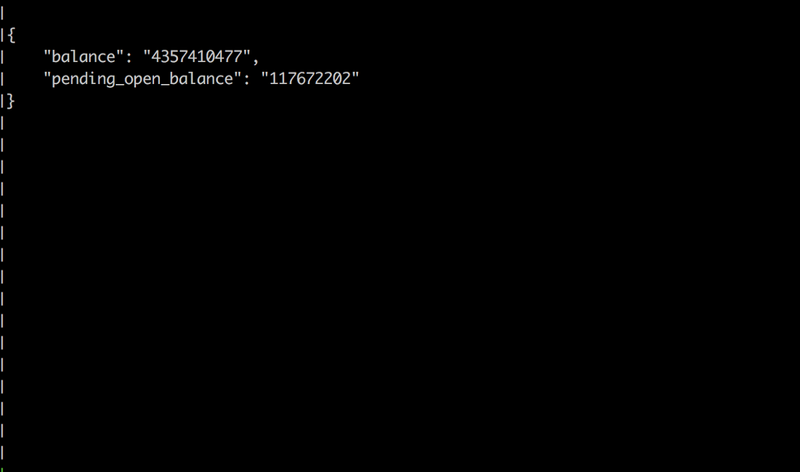 The unconfirmed_balance shows how many bitcoin are in yet-to-be-mined transactions. I guess these transactions are from opening and closing Lightning Network payment channels. The top-right pane shows the output of the lncli channelbalance command. This shows the total capacity of all my open channels, balance. The pending_open_balance number shows how much bitcoin is being used to establish channels. The bottom-right pane shows the output of the lncli getinfo command. I pay attention to the num_pending_channels and num_active_channels. These are the numbers I want to go up. I struggle to get a sense of what lnd is doing. There is always a large amount of unconfirmed bitcoin. lnd could be using a low on-chain fee setting and taking long to confirm. I look up some recent transactions in a block explorer. 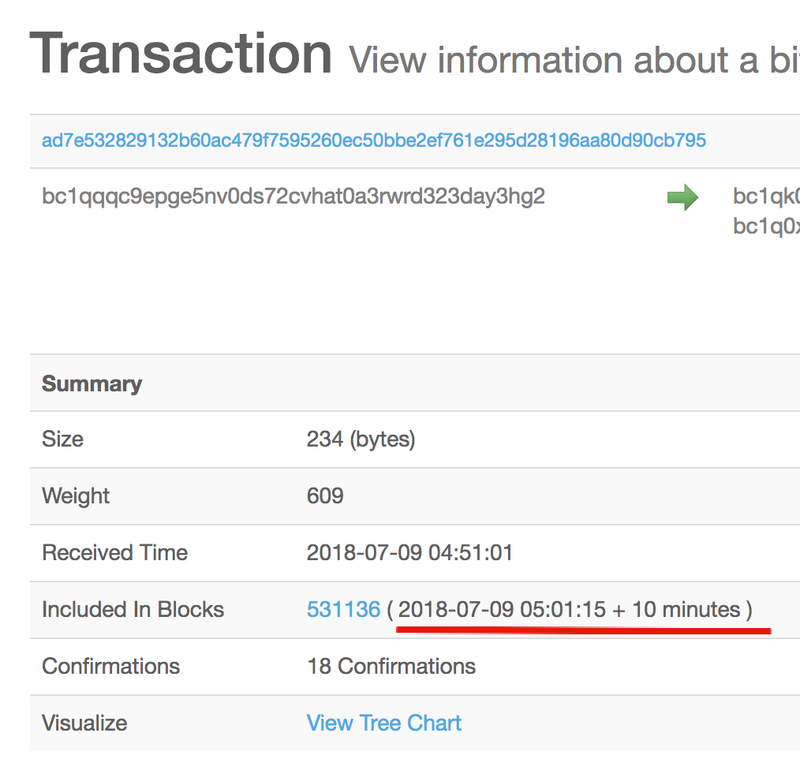 The Bitcoin network fees are quite low and yet the transaction confirmed quickly. I may need to wait for more channels to close so that I have more unspent outputs. 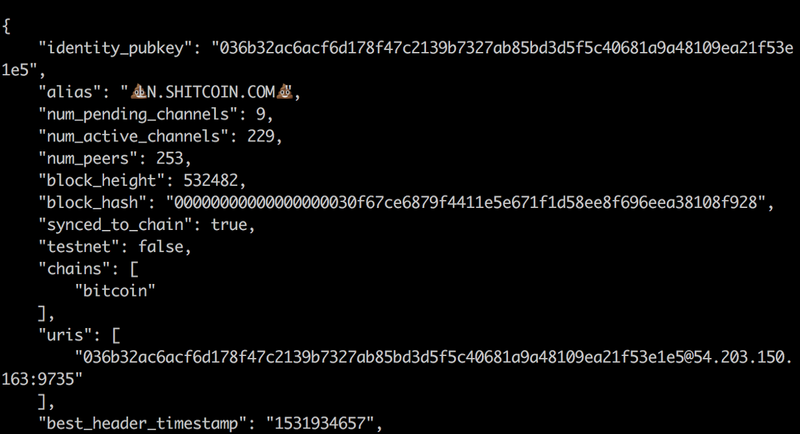 I edit the lnd config to demand higher fees for routing transactions and allow more channels to be open. lnd is currently using all my system resources. I don’t mind restarting it. The settings are difficult to understand. I increase the bitcoin.basefee and bitcoin.feerate values until other nodes stop opening channels with me. I set the values for bitcoin.basefee and bitcoin.feerate to 100 times the defaults and restart lnd. While I wait to see how the new settings affect my Lightning Network node, I verify my node with robtex.com. 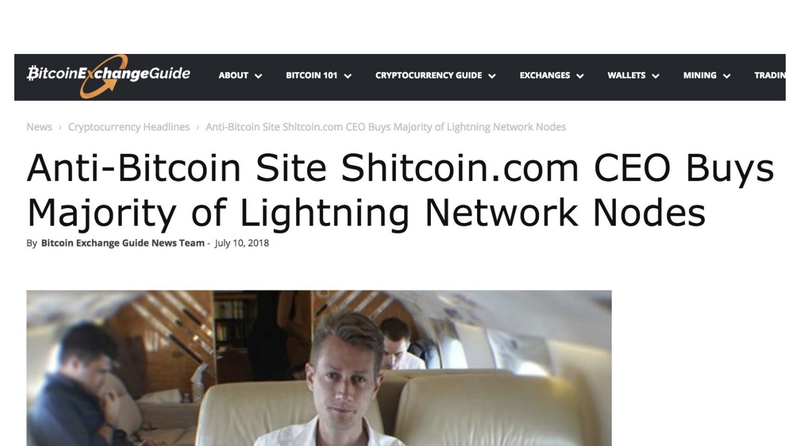 I discover that lnd.shitcoin.com is the world’s leading Lightning Network node! 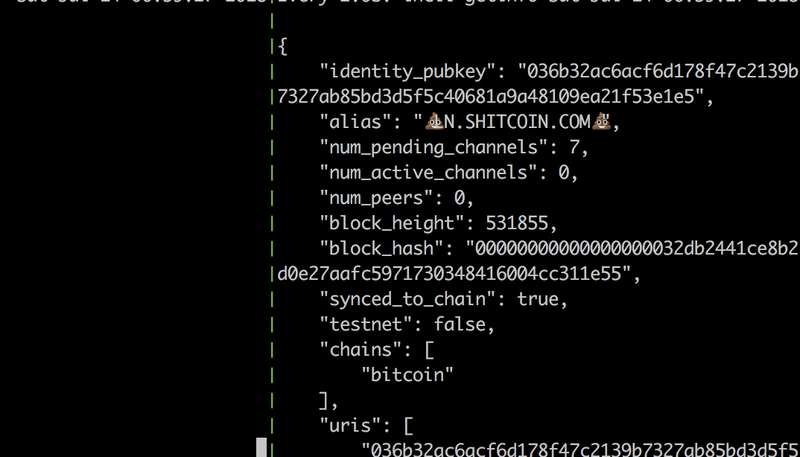 Thanks to user “rompert” of the Lightning Network Slack chat for helping me verify the shitcoin.com Lightning Network node using DNS. Reactions to my experiment on social media are mixed. The increase in capacity of the Lightning Network is celebrated by some. Taking fresh Tinder profile pictures on my way to Anarchapulco. 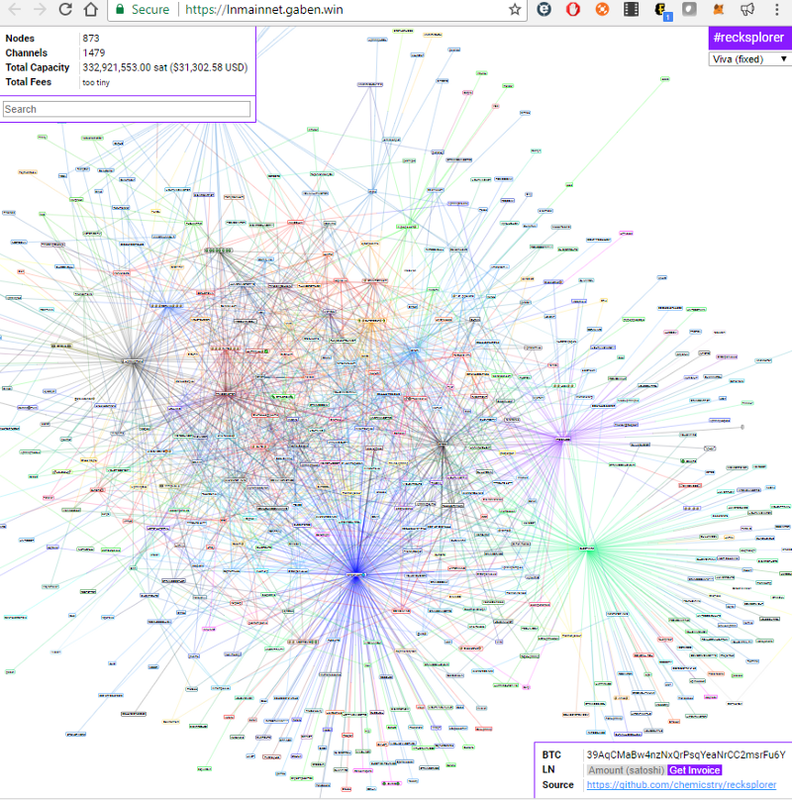 My Lightning Network node has established over 200 payment channels with 250 peers. The node capacity is exceeding 40 bitcoin. The num_pending_channels remains the same for several hours. I worry that my node has crashed. I restart lnd. The num_active_channels is zero. Many lncli commands fail to execute with a timeout errors. I hope lnd is restoring and verifying its internal database. After 20 minutes the normal channel stats are back. Is this because of all my channels? I consult my friend Felix Weis. He recommends disabling ZeroMQ notifications from bitcoind about new transactions. lnd should be able to scan through these transactions once they’re included in a block. I change the autopilot.minchansize and autopilot.maxchansize settings of lnd to the hard-coded maximum channel size of the Lightning Network, 16777215 satoshis (0.16777215 bitcoin). This should lead to fewer, but higher value payment channels. I notice a performance improvement. lnd is eating less CPU. I don’t expect to make much profit from other users routing payments through my node. Lightning Network on the Bitcoin mainnet is new. There aren’t yet many services/merchants accepting Lightning Network payments. I wonder how much I’ve currently profited from routing payments. I try the lncli feereport command. The month_fee_sum comes to 4289 satoshis, or 0.00004289 bitcoin ($0.31). I also wonder how any payments have been routed. I write a small script using awk that summarizes the output of lncli fwdinghistory. The command syntax is difficult to get right. I ask on the Lightning Network Slack chat and eventually figure it out. In part three I’ll try to put my Lightning Network node to use and start paying for services. Maybe I’ll even do some gambling. Subscribe to the newsletter below to find out. See you back here for part three, blockchainers!